By all accounts it is a whopper. 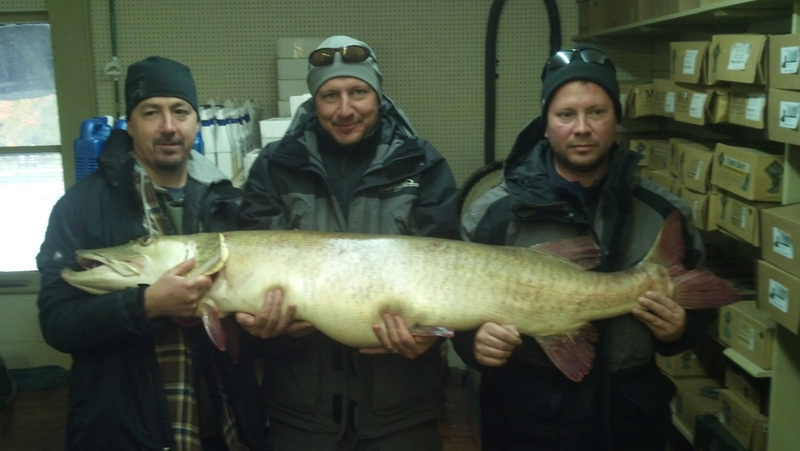 Michigan’s Department of Natural Resources just confirmed the catch of a new state-record Great Lakes muskellunge. The fish was caught Saturday, Oct. 13, 2012 by Joseph Seeberger of Portage, Mich.. He was fishing Lake Bellaire in Antrim County with friends. Seeberger hooked the 58 pound, 59 inch long fish. It had a girth of 29 inches and took nearly two hours to land, requiring the help of friends. DNR staffers say the previous state-record Great Lakes muskellunge was caught by Kyle Anderson of Rapid City, Mich., on Torch Lake in Antrim County on Sept. 27, 2009. That fish weighed 50.5 pounds and measured 56.13 inches. This entry was posted in Uncategorized and tagged DNR, Fishing, Joseph Seeberger, Lake Bellaire, Muskellunge, Muskie, State Record Fish. Bookmark the permalink.